It's very small and underwhelming, but it appears to be genuine given the source. 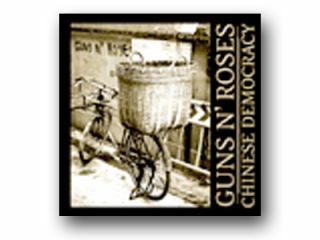 Yesterday we revealed that BestBuy had pre-order listings in its online store for three different versions of the Chinese Democracy cover art. Now, the US retail chain appears to be the first site anywhere to publish the artwork for the ludicrously long-awaited new Guns N' Roses album. We know it's very small here in the original BestBuy store listing, so we've blown it up for your viewing pleasure. Please excuse the frankly diabolical picture quality. If you squint a bit, it looks better. Street Of Dreams is believed by many fans to be the song that had been circulating online under the name The Blues.